Thank your guys with stylish groomsman gifts from American Bridal, now on sale up to 70% OFF! For outdoor parties, you can't beat our top-selling Embroidered Cooler Chairs, now only $32.95/each with FREE personalization. Find great deals on barware, flasks, outdoor gifts and more in the sale category. * Sale prices and coupon savings valid through Sunday, July 29th Free Ground Shipping applies automatically to qualifying orders ($149 or more before tax and shipping). Please contact affiliates@americanbridal.com with any questions. Make your summer reception special with decor from American Bridal, this week up to 60% OFF! Cool down a warm summer wedding with these Wedding Paddle Fans, available in 13 colors and now only $1.75/each. Find great deals on cameras, cake servers, bubbles, toasting flutes, and more in the sale category. * Sale prices and coupon savings valid through Sunday, July 15th. Free Ground Shipping applies automatically to qualifying orders ($149 or more before tax and shipping). This Forever Save the Date card is the perfect example of what a classy photo card should be. 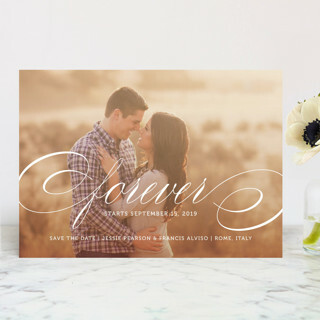 Your engagement photo take center stage with the word Forever graces across. It is understated and elegant. If you are looking for monogram invitations, check out this Sealed With Love design. Bride and groom's initials are featured on top of a faux wax seal. It has a refined, vintage feel. Go all out with the ultimate keepsake with this Hold the Date Wedding Invitation. Multiple pages allow you to include more wedding details and photos. 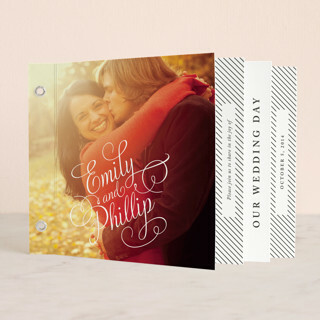 This is a modern alternative to the pocket fold invitations. What style do you like the most? 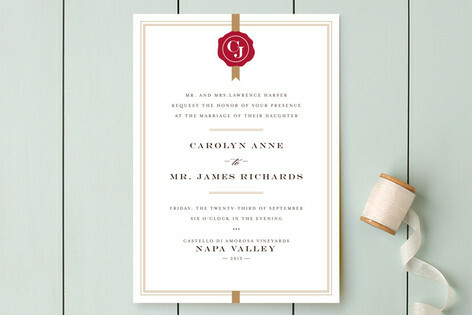 See more Minted's Unique Wedding Stationery. Don't forget to enter their wedding invitation giveaway!